Like in many places across the U.S., the real estate market is booming in Aspen, Colorado. And, as companies move in to replenish the dwindling housing inventory, one real estate developer hopes to provide a more sustainable alternative to the inevitable onslaught of cookie-cutter homes. 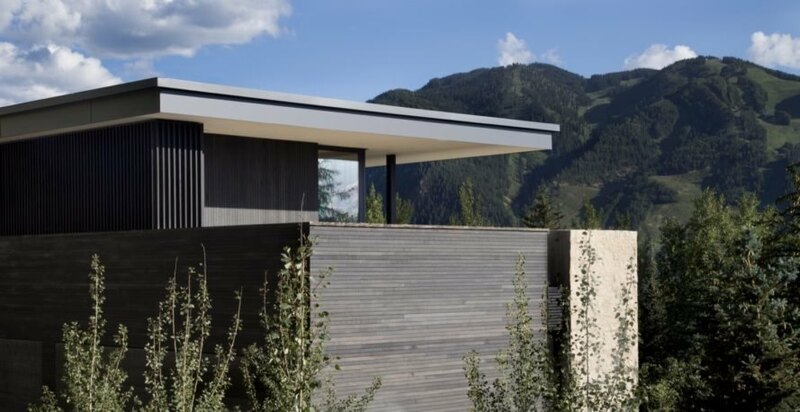 Working in collaboration with San Francisco-based Aidlin Darling Design, the developer has completed a solar-powered dwelling that serves as a new energy-efficient prototype for speculative real estate in Aspen. 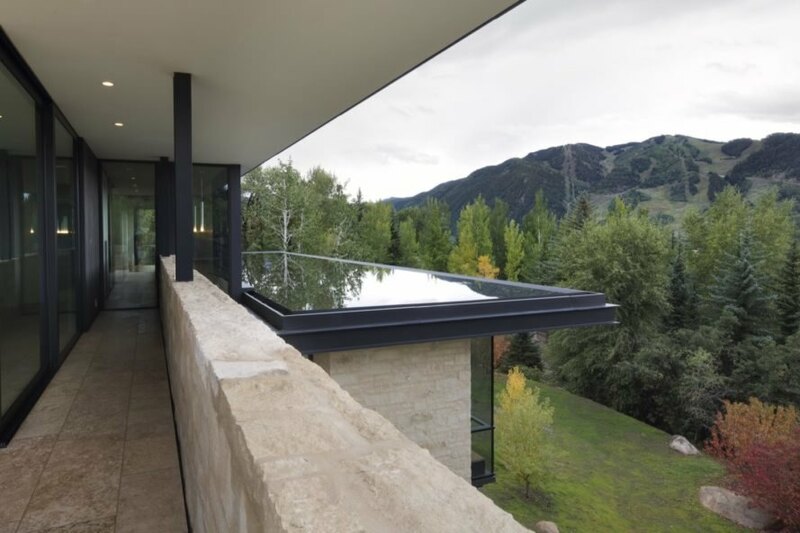 Located on the steep slopes of Red Mountain, the Aspen Residence boasts spectacular panoramic views that overlook Aspen to the west and an undeveloped landscape to the south. The spacious home covers an area of 9,618 square feet and is oriented on a north-south axis to maximize views, preserve privacy, and optimize passive solar strategies. 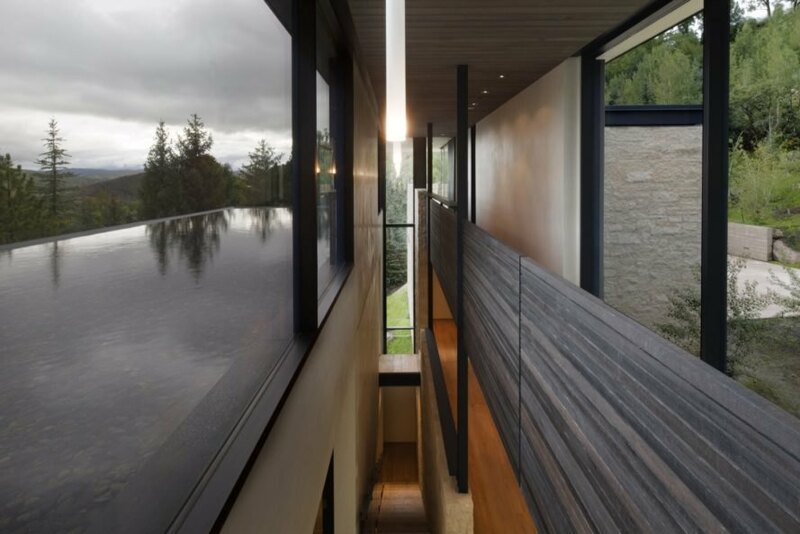 To tie the contemporary design to the landscape, the architects used local materials and long stone walls that anchor the space into the hillside and frame outdoor spaces that function as extensions of indoor living areas. Sustainability is key to the design. 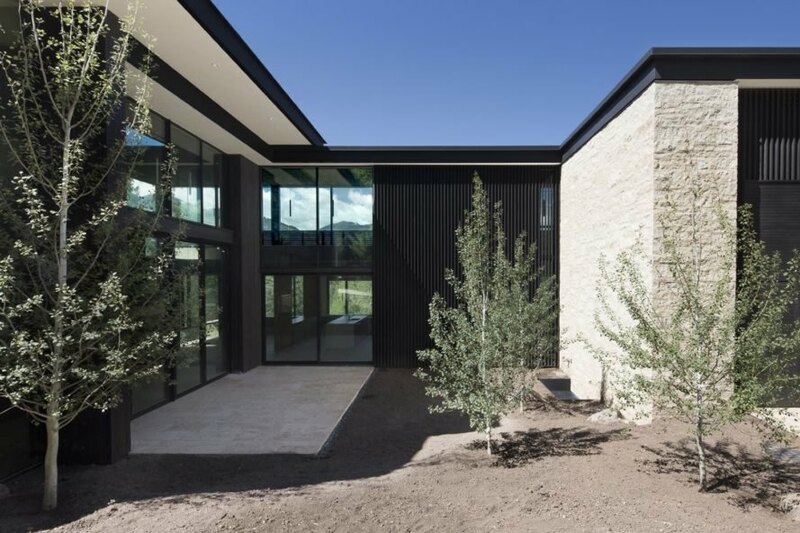 The Aspen Residence’s rooftop is integrated with a 12.6 kW solar photovoltaic array as well as a green roof and solar hot water panels. The roof is also designed to slow and reduce stormwater runoff in conjunction with the on-site bio-retention pond. To reduce energy demands, the home is wrapped in closed cell spray foam insulation and punctuated with glazed windows and doors that let in natural light and promote natural ventilation. Moreover, energy-efficient radiant heating is built into the floor slabs and a heat recovery ventilation system recaptures heat from exhausted indoor air. The aluminum windows and doors are from Schuco. 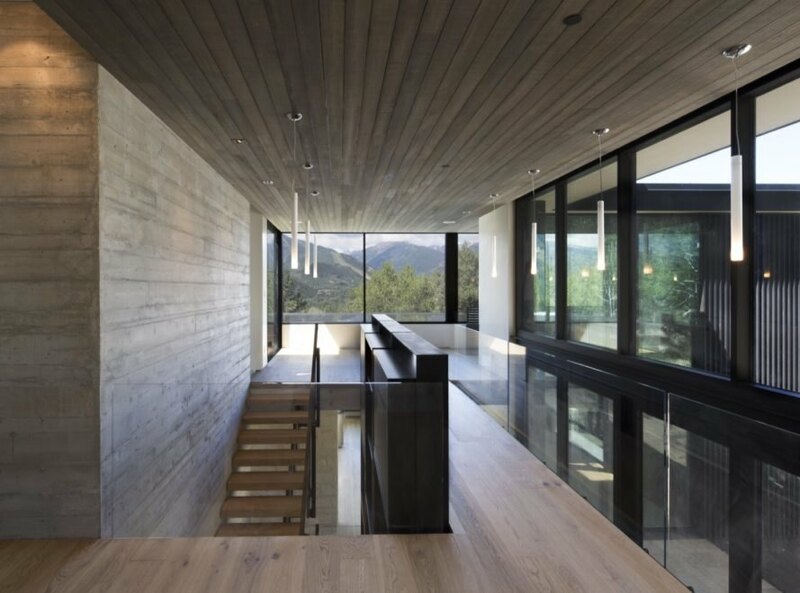 The home is clad in wood and limestone. 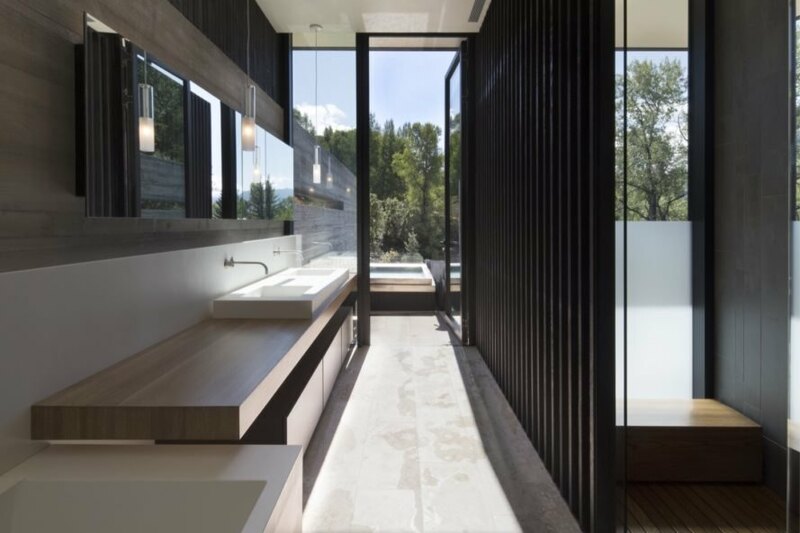 The home overlooks views of Aspen to the north and undeveloped land to the south. A 12.6 kW solar photovoltaic array tops the roof. The reflecting pool obscures views of the neighboring homes. The outdoors are brought in with full-height glazing. The bathroom has solid rift white oak countertops. A look at the sustainability diagram.